The Outer Banks Visitors Bureau is pleased to assist you with your image/footage request. Please fill out the form below and we will get back to you as soon as possible. Use of any photos, slides or videos owned by the Outer Banks Visitors Bureau may only be used for editorial and limited public use purposes. Images and footage are not for commercial use, under any circumstances, unless authorized by the Outer Banks Visitors Bureau. No financial gain is permitted with the use of photos, slides or video owned by the Outer Banks Visitors Bureau. The Outer Banks Visitors Bureau does not give up ownership of any of the images. Images are to be used solely for the requested purpose. Photo credit is to be given to the Outer Banks Visitors Bureau outerbanks.org for use of all images and footage. As a service to your readers/viewers, please feel free to include the Outer Banks Visitors Bureau’s toll free number 877-629-4386 and web site www.outerbanks.org as a source of visitor information. 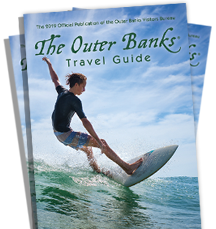 The Outer Banks Visitors Bureau is a public authority and the lead marketing and promotional agency for the Dare County portion of The Outer Banks of North Carolina.